My story begins with the phone call I received from Matt at Wimco telling me how I had just won the Celebrate Summer in St. Barts Sweepstakes. The prize included 5 nights at the Hotel Carl Gustaf and round-trip airfare for two. I was absolutely thrilled! My husband, George, and I had heard wonderful things about the island over the years and we were eager to see it for ourselves. Our flight into St Barts was just as we expected. A bit scary, but our excitement drowned out all fears. Christophe of the Hotel Carl Gustaf met us at the airport, and after a short drive through Gustavia we were at the hotel within minutes of landing. I noticed how clean the streets were and how well maintained the homes and businesses were. This is definitely a well-cared-for island. The reception area and restaurant sit on a hillside overlooking the main town of Gustavia and its picturesque harbor, with the villa suites scattered below. 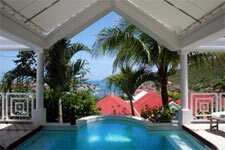 A series of steps and landings with a gorgeous row of palms down the middle leads you to your suite. Since each suite is in a separate building surrounded by foliage, there is lots of privacy. Our suite at the Carl Gustaf was airy and spacious with flowers everywhere, soft music playing and champagne chilling. The view of Gustavia and its harbor was incredible! The main living area has wall-to-wall sliding glass doors which lead to your plunge pool and deck area with the magnificent view. The suite is beautifully decorated with everything you could want: CD player, DVD, VCR, satellite TV, A/C, ceiling fans, a small but well-equipped kitchen and very comfortable furniture. The bedroom has lovely French doors, which open up to the deck. The bathroom is well appointed and immaculate. After unpacking, we walked into town, which is a quick walk (less than 5 minutes) but you do have to go up and down the hill, which is quite steep. Some good walking shoes are a must. It was Saturday afternoon and most of the shops were closed until later so we headed to the AMC supermarket for some snacks. I was intrigued by the excellent selection. Wonderful French wines, cheeses, breads, charcuterie - even the frozen dinners looked amazing! Everything is in French so I highly recommend learning a few common terms before a visit. We spent the rest of the afternoon lounging by our pool. The deck and pool area is completely private and we spent a lot of time out there during our stay. Front row seats for the amazing sunset over Gustavia with its yachts in the harbor and red roofed buildings beckoned us nightly. Dinner that night was at the hotel’s restaurant. 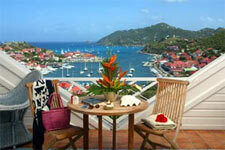 Excellent French food, fabulous service and a fantastic view of Gustavia, all in a lovely open-air setting. If you like foie gras, order the appetizer, it was the most foie gras I’ve ever seen on a plate. Wonderful! Sunset drinks here are a must while on the island.